Abstract. 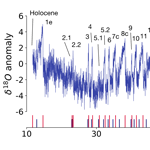 Dansgaard–Oeschger (DO) events constitute the most pronounced mode of centennial to millennial climate variability of the last glacial period. Since their discovery, many decades of research have been devoted to understand the origin and nature of these rapid climate shifts. In recent years, a number of studies have appeared that report emergence of DO-type variability in fully coupled general circulation models via different mechanisms. These mechanisms result in the occurrence of DO events at varying degrees of regularity, ranging from periodic to random. When examining the full sequence of DO events as captured in the North Greenland Ice Core Project (NGRIP) ice core record, one can observe high irregularity in the timing of individual events at any stage within the last glacial period. 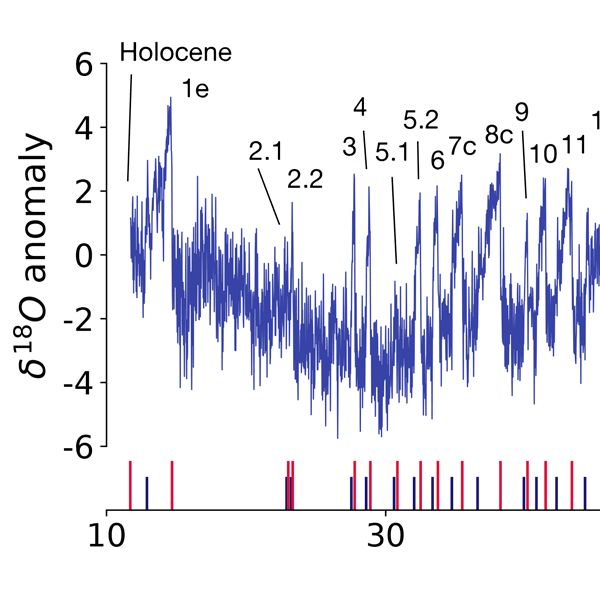 In addition to the prevailing irregularity, certain properties of the DO event sequence, such as the average event frequency or the relative distribution of cold versus warm periods, appear to be changing throughout the glacial. By using statistical hypothesis tests on simple event models, we investigate whether the observed event sequence may have been generated by stationary random processes or rather was strongly modulated by external factors. We find that the sequence of DO warming events is consistent with a stationary random process, whereas dividing the event sequence into warming and cooling events leads to inconsistency with two independent event processes. As we include external forcing, we find a particularly good fit to the observed DO sequence in a model where the average residence time in warm periods are controlled by global ice volume and cold periods by boreal summer insolation. How to cite: Lohmann, J. and Ditlevsen, P. D.: Random and externally controlled occurrences of Dansgaard–Oeschger events, Clim. Past, 14, 609-617, https://doi.org/10.5194/cp-14-609-2018, 2018.